PHILADELPHIA (Embargoed until 4 p.m. EDT, Saturday, June 23, 2018) – A novel positron emission tomography (PET) tracer has been developed that can accurately image cardiovascular infections, which are extremely dangerous and have a high fatality rate. The research was presented at the 2018 Annual Meeting of the Society of Nuclear Medicine and Molecular Imaging (SNMMI). 6′′-[18F]Fluoromaltotriose was able to image valvular infection with high sensitivity and specificity. Results showed an approximate 2.5-fold higher mean tracer uptake in the aortic valves of the infected mice when compared to the control mice. Plans are currently underway to have this PET radiotracer translated into the clinic. Figure 1. 6′′-[18F]Fluoromaltotriose is a new PET imaging agent that is able to visualize valvular infection of bacterial origin with high sensitivity and specificity. 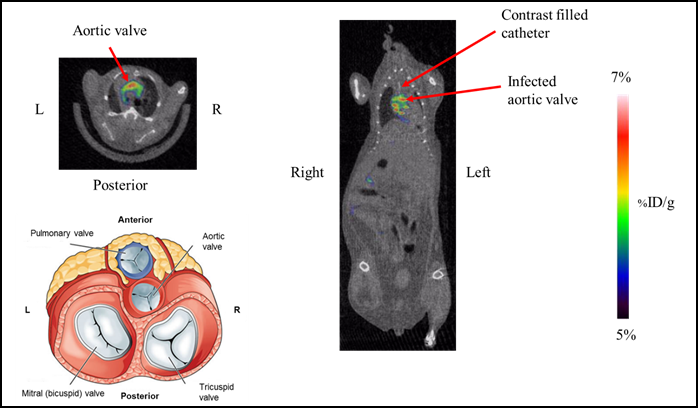 PET/CT imaging of a Staphylococcus aureus-induced endocarditis mouse model with 6ʹʹ-[18F]Fluoromaltotriose showed that the heart had the highest PET signal above the diaphragm (as it was the source of infection), while the kidneys had the highest signal below the diaphragm. Within the heart, the PET signal from the infected aortic valve had the highest uptake and could be clearly seen; in some cases, the tricuspid valve was also infected (similar to what is seen for intravenous drug users). Credit: Sanjiv Sam Gambhir, MD, PhD, Stanford University School of Medicine, Stanford, CA. Abstract 36: “Molecular Imaging of Cardiovascular Infections with 6ʹʹ-[18F]-Fluoromaltotriose PET/CT,” Mirwais Wardak, PhD, Gayatri Gowrishankar, PhD, Xin Zhao, MD PhD, Mohammad Namavari, PhD, Yonggang Liu, MD PhD, Evgenios Neofytou, MD, Tom Haywood, PhD, Joseph C. Wu, MD PhD, and Sanjiv S. Gambhir, MD PhD, Stanford University School of Medicine, Stanford, CA. SNMMI’s 65th Annual Meeting, June 23-26, Philadelphia. This research was supported by a National Institutes of Health grant (#5T32EB009035-08), and funding from the Department of Radiology, Stanford University School of Medicine.